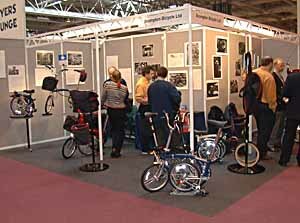 The Cycle & Leisure Exhibition at the NEC is a Trade Exhibition, and is only open to the public on the Saturday (although due to poor publicity and the fact that there are no retailers selling products there, apparently few members of the public turned up). I visited the exhibition on the Monday, when it was very quiet indeed, although I'm told that Sunday had been quite busy. 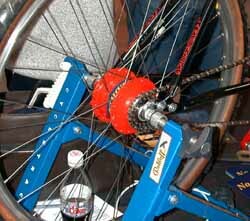 As might be expected, the emphasis was on mountain bikes and components for them. 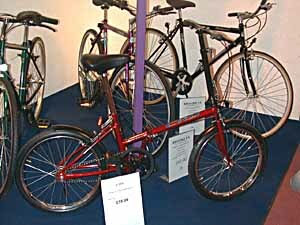 Only Brompton of the major manufacturers of folders and separables was present, but was putting on an excellent display. There were a number of items of potential interest on display, and we'll show these below under the headings Moulton, Brompton, other folders and odds and ends. Apologies for the size of the file and the time taken to download, but pictures are really essential for an article of this kind, and they have been compressed as far as seems acceptable while maintaining a reasonable level of reproduction. 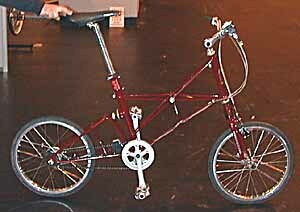 Although neither Pashley nor Moulton were at the exhibition, this Moulton was spotted there. 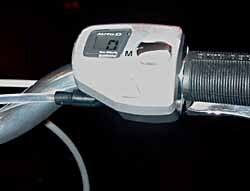 We think it was a Shimano test bike, as it bore the unusual model designation (on the frame kingpin) "FX4". It had automatic electronically controlled gearing, apparently with a means to adjust the gear change point to suit the rider, and also a manual (electrically controlled) over-ride for selecting the gear of the rider's choice. 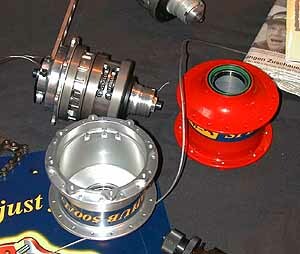 This close up shot shows the rear hub gear and control unit. This is the handlebar control - electrical connections to the hub, with a large auto/manual switch and push buttons for manual down or up changes. 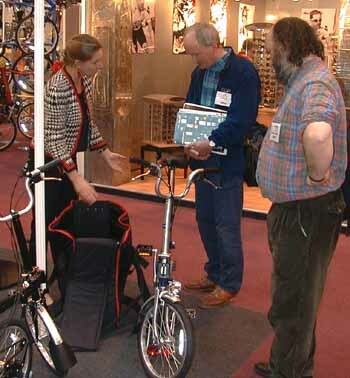 Brompton had an impressive stand, with examples of every model in every current colour. The less standard ivory, yellow and blue/silver are now only £12.50 more than the standard colours. The blue/silver combination will only be available in 1999 - a new 'colour of the year' will replace it next year, and will change every year. Several prototype bags were on display on the stand, although design has not been finalised, so don't expect to see them in the shops immediately. The first is this larger front bag, with a transparent map pocket and lots of useful compartments. 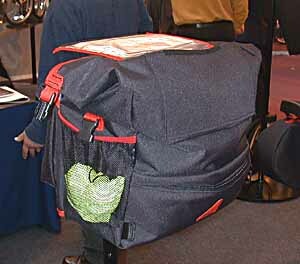 This is a second new bag, in the form of a saddle bag, vaguely along the lines of the extremely useful Moulton day bag. This is a very preliminary design, and the size and shape have yet to be finalised. 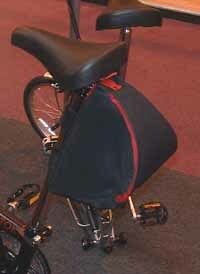 To fold the bike and lower the seat pillar it is only necessary to release the 2 Velcro straps, the bag remaining hanging from the saddle. ...and this one shows it opened (right) out (Hilary Stone looks on with interest). 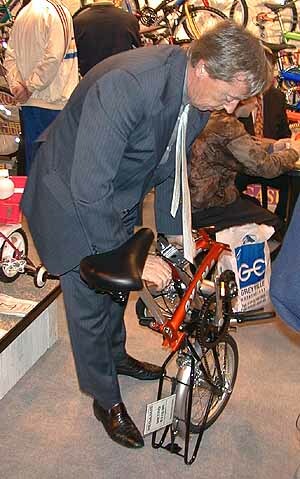 Overheard on the stand: The Brompton range is likely to be extended at both the top and bottom of the range. 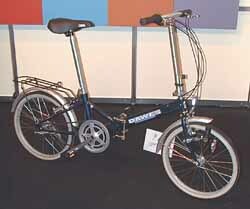 A 7-speed Brompton with a Sturmey-Archer hub is expected, plus a light single speed model (light means the elimination of the hub gears and other non-essential components, rather than any fundamental change to the design or materials). No date was mentioned, but I suspect that the new models are not imminent. A Birdy Red was spotted parked by one of the lounges. In terms of folders on display on stands, we saw a few examples which are pictured below. This fairly basic folder was seen on the Concept Cycling Ltd stand near the entrance. The price label reads £58 (which may be a trade rather than retail price, but is still rather remarkable even for such a basic machine!). A more serious new folder is the new Dawes Metropolis is mentioned in the latest issue of A to B. 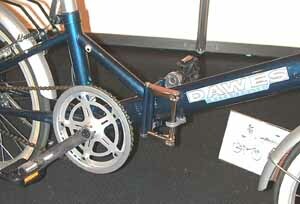 It is apparently a Dahon made specifically for Dawes. This modestly priced machine was on offer from Pegasus Cycles, priced at £110.90. 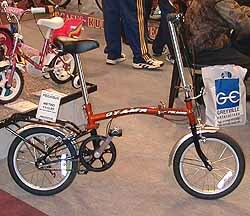 The gentleman on the stand was quite apologetic about his lack of expertise in folding it, and also commented, quite unprompted, that it was not a serious machine like the Brompton. But then, it's a lot cheaper. 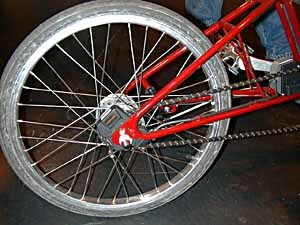 This impressive piece of engineering is the Rohloff hub gear. Although Rohloff have talked to folder manufacturers we don't think anyone is planning to adopt it in the immediate future.